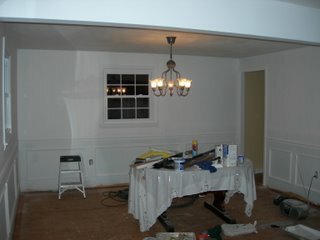 Update on the construction zone - we've installed the new chandelier and the moulding is up - everything has a fresh coat of primer! NEXT STEP: Paint! More pics to follow... Stay tuned! Flooring will be delayed until next week - :( oh well! I love it! It's so pretty! I can't wait to swing on it! Ha! J/K of course! It looks awesome! It seems to be coming along quickly!